In the wake of the stunning news that more than half of white women who voted on Nov. 8 opted for Donald Trump, I have concerns—and questions. I’m aware that not all white women are racist. But given the significant number of white women who supported Trump, it is legitimate to at least question their motives—especially the thinking of those who are college-educated and middle-class. Were they responding to Trump’s sickening call to “take back our country”? If so, take it back from whom, exactly? And bring it where? For college-educated white women, especially those who are in their 30s or 40s and who have jobs; for white women who have benefited from affirmative action, you have to wonder why they felt it a good idea to support a man who is not smart and who demeans people of color, the disabled and even white women. If you are driven by fear, we would like to know: Exactly what you are so afraid of? I’m on the record—unironically, and without snark—as saying that many of my best friends are white women. I don’t feel obliged to spend a lot of time here outlining my bona fides on this front. But it is obvious that millions of white women whom I probably would not ever have identified as racist or even “racism-blind” betrayed me and mine by voting for Trump. And adding to the disillusion I am now experiencing is that fact that many of the white women who helped the untested, boorish, stunningly ignorant 70-year-old white man in his mad quest to replace our nation’s first black president were stealthy if not downright deceptive about their reasons. I’m here now to call it out. In black America, the shorthand for women who harbor virulent fear and resentment of black people—however covertly it is expressed here in the 21st century—are known as “Miss Anns.” It is our not-so-secret vernacular description of white women who were the wives, sisters, daughters and mothers of slave owners in the Deep South. This figure, and her sometimes sly, always pernicious way of expressing her fear and resentment of blacks, is a recurring theme in black American literature, because Miss Ann was with us hundreds of years before Barack Obama was born to a white woman from Kansas. Her sense of entitlement blends with incipient curiosity about blacks in general and about black men in particular, and suggests, in all probability, an attraction that she cannot readily articulate. The resulting defining character trait of Miss Ann is the unacknowledged passion that seemingly drives the anger she will inevitably express. If you’ve ever read Zora Neale Hurston or Maya Angelou, you have seen this reference. 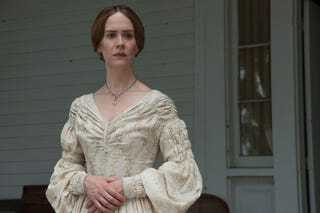 If you viewed the Academy Award-winning film 12 Years a Slave, you have seen the “Miss Ann” type embodied in the terrific performance of Sarah Anne Paulson as Mary Epps, the wife of the owner of a plantation where the protagonist, Solomon Northup, was held. I’ll take this moment to remind you that while creative license was taken by filmmakers, and undoubtedly by the original publishers, Northup’s story is real. The Mary Epps portrayed by Paulson, with a cataclysmic range of hate expressions from seething silence to explosive violence, is based on women that Northup dealt with during his horrific journey from freedom to slavery and back again. The invoking of their privileged status; their belief, however inchoate, that their “virtue” must be protected at all costs, and certainly at the expense of black, brown or other marginalized folks, is a key Miss Ann trait. What likely drove many of the white female Trump voters is the same instinct that drove white women to accuse black men of all manner of imagined affronts since at least the antebellum era: a deep, innate fear and resentment of black people, particularly of black men. The patriarchal motif looms large in attempts to answer the question of what white female supporters hope to gain by voting for Trump. It isn’t strictly a zero-sum game of reaping “gains” per se, as much as it is holding ground that some white women perceive as being theirs alone: The white women who approved of Trump as leader of the free world are betting on his ability to preserve their protected status. Whether they acknowledge it or not, white women do enjoy a higher rung on the social and economic order in the U.S. than do black and Latino women. The perceived “halo effect” of being in close proximity to powerful white men appears to be at the least a subtext of what drove some white women to vote for Trump. I’m not qualified to make a deep dive into the history of psychosocial causal factors for why some white women apparently still harbor such virulent fear and resentment of black men. And it also must be said that by now, versions of this resentment are directed at black women. This dynamic likely did inform the decisions of millions of white women who voted for the GOP candidate Nov. 8. That their peculiar sentiments were not explored in detail and revealed by the legions of pollsters, campaign correspondents and pundits is cold comfort. I actually take responsibility, short of feeling guilty, for having missed this possibility that as America’s first black president, and his wife and children, occupied the White House—quite literally serving as the embodiment of the United States in the eyes of the world—there were millions of Miss Anns out there quietly seething. The “Security Moms” who helped elect George W. Bush president in 2000 and 2004 were likely reacting to at least deeply buried Miss Ann instincts. And the periodic episodes of millennial-age white women such as Lena Dunham—who pride themselves on being “woke” and yet can slip right quick into Miss Ann behavior—is an example of the powerful effect. The 2013 episode in which a white woman named Ellen Sturtz rudely interrupted remarks by first lady Michelle Obama during a Washington, D.C., fundraiser is another stark example of Miss Ann entitlement. Now, staring into the yawning abyss of a Trump presidency, I feel acutely that I’ve been betrayed. I’ve written before about my on-again, off-again concerns about the role of deference in black-white relationships in America, how individuals and institutions and systems are still shaped by long-standing expectations that blacks must always defer to white needs and preferences. Social media warriors such as DeRay Mckesson have pushed phrases like “white privilege” and “intersectionality” onto the public debating stages, which is good and bad: There are powerful platforms now and access to megaphones to define our positions … which inevitably makes many white people uncomfortable. I make no excuses for them; I am only pointing out that chief among those most recently made uncomfortable by social and political developments over the past few decades are white women. I have had my own run-ins with variations of the Miss Ann effect over the years. I just never considered that any women in my sphere—in my age, occupational or education cohort—might do such a damaging thing as vote for Trump. Now I’m compelled to look more closely at some of the women I encounter on the regular; to regard them, not with fear or even stark trepidation, necessarily, but certainly with a far more cold-eyed assessment of what might lie beneath the smiles and words of bonhomie. The Miss Anns of 21st-century America are no longer yelling at their menfolk to lash us harder. But by voting for Trump, and approving his leadership of the most powerful government in the world, they weaponized a terrible instrument of oppression to keep us in our place. Amy Alexander, an award-winning writer and editor in Silver Spring, Md., is the author of four nonfiction books, including Uncovering Race: A Black Journalist’s Story of Reporting and Reinvention. She has produced stories for the National Journal/Atlantic, NPR, The Nation, The Root and other outlets.